SYDNEY, N.S. 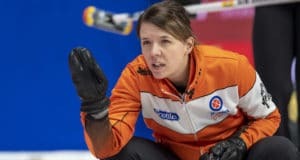 — Even though her team is tied for the best record in Pool B of the 2019 Scotties Tournament of Hearts, Wild Card skip Casey Scheidegger stepped off the ice Wednesday morning at Centre 200 thinking that Thursday could be a long day featuring tiebreakers for her Lethbridge, Alta., squad. SYDNEY, N.S. – Chelsea Carey took the first big step towards a second Scotties Tournament of Hearts championship Tuesday, posting two wins to remain unbeaten and secure a berth in the Championship Pool for Team Alberta. SYDNEY, N.S. – Don’t count us out, Team Canada skip Jennifer Jones cautioned after back-to-back losses Monday at the 2019 Scotties Tournament of Hearts. SYDNEY, N.S. — If we’ve learned nothing else at the 2019 Scotties Tournament of Hearts, we can say with certainty that Tracy Fleury and Team Manitoba are not so strong starters, but superb finishers. SYDNEY, N.S. 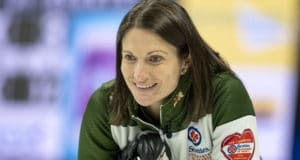 – Monday was a rare two-loss day for Jennifer Jones, a result that left Team Canada now in a dogfight to advance into the Championship Pool at the 2019 Scotties Tournament of Hearts. SYDNEY, N.S. 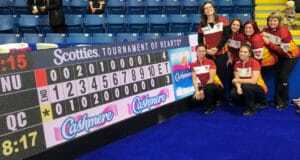 – Manitoba and Northern Ontario posted “must-have” victories at the 2019 Scotties Tournament of Hearts Monday afternoon, while Alberta and Ontario also produced wins to remain the only unbeaten teams in Pool A.
SYDNEY, N.S. — It was a snowy Monday night in Charlottetown, almost exactly eight years to the date, the last time Suzanne Birt beat Jennifer Jones in a curling game. SYDNEY, N.S. 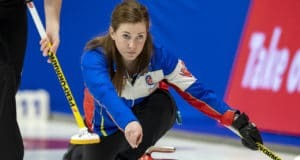 – Chelsea Carey and her Team Alberta came into the 2019 Scotties Tournament of Hearts figuring they had to win two of three key round-robin games to be in the fight for the Championship Round. They completed that goal by winning their third game, a 7-6 win over Team Northern Ontario Sunday evening. SYDNEY, N.S. – Last year’s wild card team went to the final of the Scotties Tournament of Hearts and this year’s team, skipped by Casey Scheidegger of Lethbridge, Alta., is looking for a repeat performance. SYDNEY, N.S. — Sarah Wark’s 33rd birthday is off to a roaring start. SYDNEY, N.S – Jennifer Jones doesn’t often miss crucial shots, and when she does it usually doesn’t take long to redeem herself. 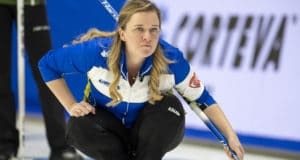 She was at it again Saturday evening, overcoming struggles with the ice to get her Team Canada off on a winning note at the 2019 Scotties Tournament of Hearts at Centre 200. SYDNEY, N.S. — Three years ago Jenine Bodner threw Nunavut’s first-ever rock in the Scotties Tournament of Hearts, and on Saturday she skipped the territory’s team to its first-ever victory in the main draw of the event. SYDNEY, N.S. — In a game that saw both team struggle with draw weight, skip Casey Scheidegger of Lethbridge, Alta., made a last-rock draw to the four-foot Friday to score one for a 7-6 win over Team Kerri Einarson of Gimli, Man., and a berth in the 2019 Scotties Tournament of Hearts. Fifth time’s a charm? 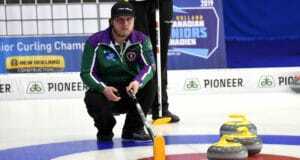 Tyler Smith from Prince Edward Island hopes it could be at the 2019 New Holland Canadian Juniors in Prince Albert, Saskatchewan. 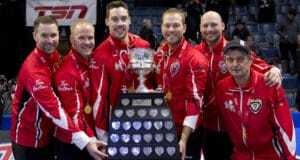 REGINA – Brad Gushue joined some legendary curling company by pulling off back-to-back Tim Hortons Brier, presented by Mosaic, titles.